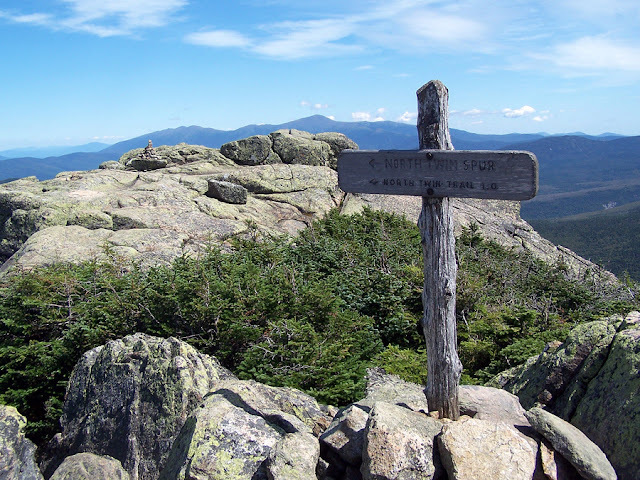 South Twin Mountain commands one of the most spectacular views from it's open 360 degree summit. Views of the Presidential Range, Bonds, and the Pemigeweasset Wilderness to the Franconia Ridge are second to none. South Twin is located on the Twinway (AT) and the two easiest ways to access the summit are from North Twin via the North Twin and North Twin Spur Trails or from the Galehead hut via the Gale River and Twinway Trails. The Twinway from the hut to South Twin summit ascends over 1,150 feet in just .8 miles and is steep, rocky, and rough but lots of fun! -North Twin/North Twin Spur Trails: 5.6 miles (elevation gain of 3,400 feet) North Twin Trail: 4.3 miles, elevation gain of 2,950 feet. The North Twin Trail follows the Little River for the first 1.9 miles crossing it three times (can be difficult to dangerous when running high but the first two crossings can be bypassed via a well defined herd path) The trail has easy grades with good footing up until the last crossing then becomes steep as the footing becomes worse. The trail ends at the summit of North Twin Mountain. From here the North Twin Spur Trail (1.3 miles 400 feet) leads to South Twin's summit as it first drops down 300 feet then rises 450 feet to South Twin. It has easy and moderate grades with generally good footing and is one of the easier hikes between two 4,000 foot mountains.